The benefits of cycling to work are now well established by numerous studies. Not only is it cheaper than driving, it’s also good for the environment and your own health. It can cut the risk of heart disease by up to 50%, make you feel happier, and you’re often more productive at work when you arrive. Despite this, only 4% of commuting trips are made by bicycle in England. However, this means when you begin cycling to work you will join an exclusive club; those who know how good cycling to work can be! So to get the best out of your commuting experience, we’ve put together this comprehensive guide to help you prepare. This will depend on how far it is between your home and the office, the type of terrain you will be riding on and how quickly you want to get there. 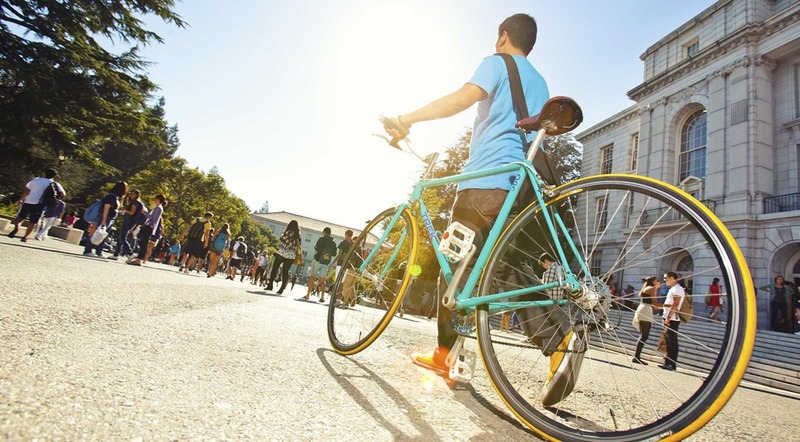 For most of us, commuting by bike will involve riding on tarmac, but you might also prefer the off-road route, which avoids the hustle and bustle altogether. For the majority of commuters, it’s likely that a hybrid or road bike will be best suited for the job, but if you do want to go off the beaten track a cyclocross bike, or a hardtail MTB would be a wise choice. Furthermore, with the advances in Electric bikes over the last couple of years you can now make your commute easier on the legs and cover greater distances without breaking sweat. 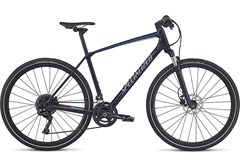 Hybrid bikes combine the fast rolling 700C wheels of road bikes with the handling qualities of a mountain bike. They are a great option for commuting in urban areas as the upright position is comfortable and gives good visibility in city traffic. In addition, they will probably have eyelets for mudguards and a rack, meaning you can keep yourself dry and carry any luggage you need on the bike. If your commute is a bit longer, some brands offer sportier hybrids specifically for fast commuting. It’s also worth considering a road bike for this type of commute. Is the 2018 Specialized Crosstrail the "perfect do-it-all bike"? The large wheel diameter and thin tyres of road bikes roll over tarmac very efficiently, whilst the frame geometry allows for a sportier, more aerodynamic position. Characteristics like these mean road bikes are the perfect tool for long distances and fast commuting. Road bikes are more versatile than you may think, and many club riders will use the same bike they race on to ride to work. Some road bikes will come with eyelets for mudguards and a rack, meaning they are just as capable for commuting as a hybrid. However, higher-end road bikes won’t have these accessories so you may need to ride with a rucksack or leave anything you might need at work in the office so it’s already there when you arrive. The Specialized Roubaix and Ruby were created to tackle to cobbles of France, and now the rough roads of Britain! With Specialized's "Future Shock" engineering, wide 28mm tyres, and disc brakes, the Roubaix and Ruby make the perfect commuting bikes. Ready to take on whatever the weather and road can throw at them, these bikes have to be our top pick for commuting on road! If you’re lucky enough to be able to ride to work via the trails, a mountain bike is the ideal choice. 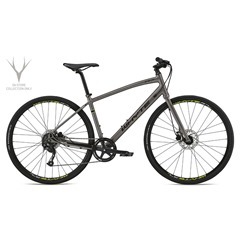 Mountain Bikes come in many different shapes but a few features are common; wide, knobbly tyres for grip, flat bars for stable handling and some kind of suspension to absorb bumps and jumps. They’re made to be given some punishment so will handle regular commuting with ease. However, they will be less efficient when rolling on tarmac, so don’t make good commuting bikes for longer road rides. 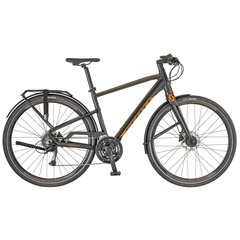 If you want a bike that will handle the trails at the weekend and take you to the office on Monday, look for a Mountain Bike with lockout forks (which minimise the front suspension), to make riding on tarmac that bit more efficient. Using an electric bike is a great way to commute to work: not only will you get to work quicker, but the pedal-assisting motor means you will expend less energy and arrive dry, comfortable and ready for the day. Plus, running an e-bike can save a lot of money compared to the cost of driving your car to work every day - over £1500 a year! If you live a particularly long way from the office and you need to use public transport, a folding bike makes the journey between the station and the office that bit quicker. Folding bikes, such as Brompton’s, are specifically designed with this kind of commuting in mind. The smaller wheels make for a compact unit once the bike is folded up, meaning getting on and off public transport is easy. Most folding bikes will take just seconds to assemble, so you don’t have to worry about lost time trying to unfold your bike before cycling to and from work. The type of clothing you wear for your commute will go hand-in-hand with the type of bike you will be using. Generally speaking, short commutes can be done in your office clothes – perhaps with a fluorescent jacket over the top – whilst longer rides might require some cycling-focused garments. Regardless, a helmet should be top of the list of items to buy, and some are designed with commuting in mind. It’s always worth leaving some spare clothes at work or taking some with you just in case the weather is particularly bad. A good tip is to leave your weekly work clothing in the office so you always know you have a clean, dry outfit to change into on arrival. This will help you feel a bit fresher and more professional. Reduce your risk of injury by wearing the hi-viz Bontrager Starvos helmet. This entry-level bike helmet comfortably fits the widest range of head sizes in seven stylish colours. The final steps to ensuring your commute is as good as it can be are bringing the right accessories with you. For those looking to commute year-round, it’s essential to use a good set of lights. It’s a legal requirement to use them when it’s dark and they will keep you visible and safe when needed. USB chargeable lights are ideal for commuting as you can replenish the battery at your desk during the day. To avoid any embarrassingly late arrivals to the office, always take a puncture repair kit, a multi-tool and a pump with you when commuting. These items should cover any occasional incident where you need to fix a puncture or adjust any loose parts when riding to work. Finally, a good lock is a necessity to make sure you have a way of getting home at the end of the day. Some offices will have secure bike parking, and it’s always worth lobbying for some if yours hasn’t. In either case, a solid U-Lock, plus a cable wrapped around both wheels, the frame and ideally a fixed post, is hard to break into, meaning your bike will be less likely to be stolen while you’re in the office. Some people don’t ride to work as they don’t want to feel flustered or sweaty when they arrive. This is understandable, but there are steps you can take to avoid this. For example, make the most of your office showers if they are provided and campaign for some to be installed if there aren’t any. Alternatively, don’t ride as hard on the way to work and always have a clean set of clothes to change into on arrival. Some brands like Muc-Off even have dry-shower products that are surprisingly effective at freshening you up. Fitting a pannier rack and Ortlieb pannier bags onto your bike may be a good way to go if you wish to carry clothes,laptops and the like into the office. You can browse the entire range of commuting products online, or you can get your hands on it in your nearest Rutland Cycling store.